If there is one hard and fast rule about living in Oaxaca, it is never go out without a camera. Most folks these days carry smartphones, at least people of a certain socio-economic class, which in our experience does not include beggars on the street or goatherds of a certain age. I say of a certain age because in Mexico these days anyone who has both teeth and shoes probably also carries a cellphone – I know the kid who takes his mom’s sheep out for a munch of grass in the afternoons after school always has his phone in his hand. So do most of the ladies in traditional dress who sell handmade things in the Zócalo. Luddites, or course, are an exception: yours truly has a dumb phone, so he also carries a pocket camera with a nice zoom lens. You just never can tell what you will run into when you leave your house and go for a drive or a walk. 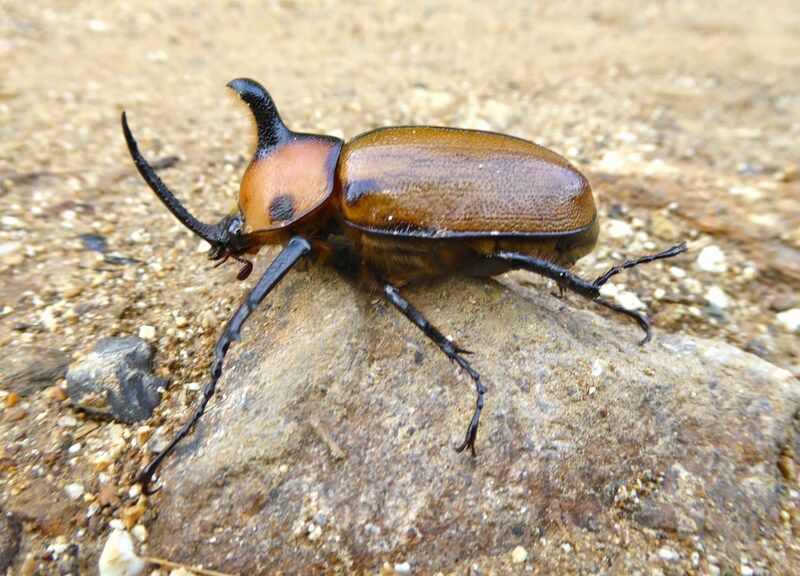 Yesterday morning, for example, Qalba and I walked a long route, right up into the lower slopes of the mountain, and on the way back I nearly stepped on this critter. 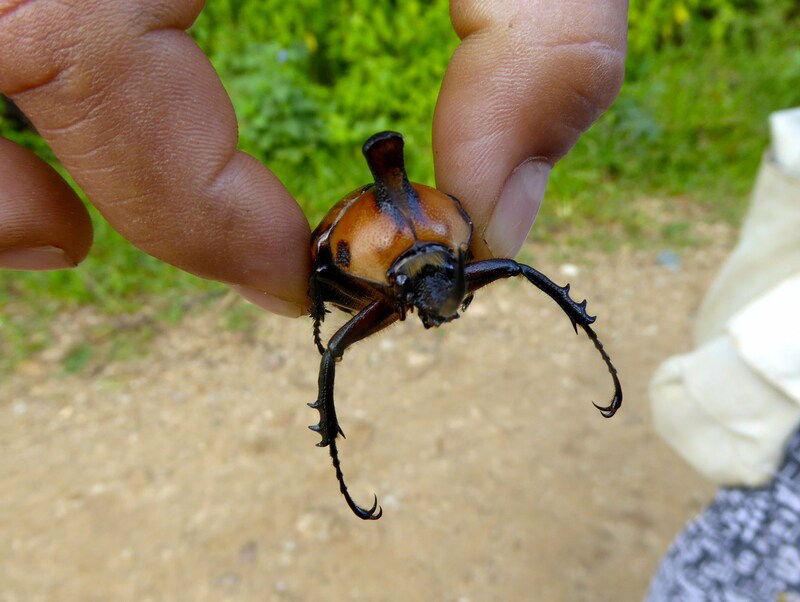 It’s a rhinoceros beetle, like the nasty black toritos that are still tunneling out of the ground around our fresno tree every morning, but a whole lot prettier. And bigger (remember, you can click on these pictures to make them even bigger! It turns this bug into a sci-fi protagonist.). Alberto, whom I bumped into a couple of minutes later and took up to see the behemoth bug, picked it up, and said he’d never seen one like that either. So far I haven’t been able to identify it on the web: anybody out there can help? Really, you don’t have to look far or be especially observant. All you have to do is step outside the front door and a couple of Inca doves are likely to come right up on the porch and coo a “Buenos días” to you. The streets of Santa Cruz are almost always good for a surprise or two. A neighbor on his way to work? Or another neighbor on his way home with a little something for the kitchen? A trip up the road to the Villa de Etla is likely to net you a castle. Or a laundromat with an unusual set of employees. Or a market stall with attitude. On a short drive in the country you might find a very small balloon festival. hile listening to music. The 44th Jew in Oaxaca gaping at Hollywood style Ecuatorian New Age Indian buskers? Little sis teaching little brother to write? A booth where you can buy both colored shaved ices & cover your head with the latest fashion? A lady who sits on a park bench and pulls a white plastic bag out of her basket and smooths it and folds it and talks to it, and opens it again and smooths it and folds it and talks to it, and then puts it back in her basket and pulls out a black plastic bag and smooths it . . .
And you can’t walk a block on any street without stopping to snap a tattered poster or a sign or a grafitto. Of course if you get tired of looking at things, you can always stop for a while here and learn how to make speeches. So, I guess what I’m saying is: What are you doing way up there when you could be down here luxuriating in our Casita and walking the streets with your cellphone (or your camera) in your hand and a big smile on your face? And polish up your oratorical skills to boot.